Hampstead NW3 WIDE or What! These lined Pinch Pleat curtains had 5.5 widths of fabric in each curtain totalling 11 widths in the bay. 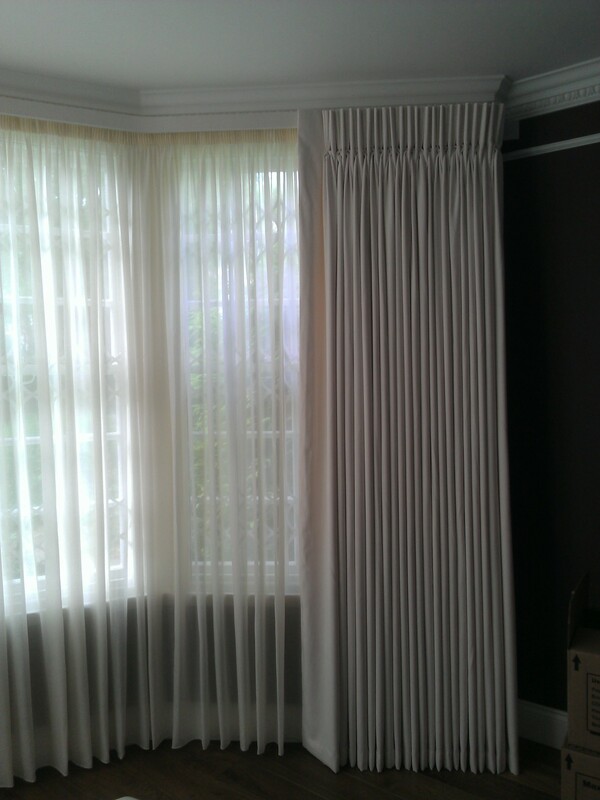 They were fitted on a fabric covered facia board and corded rail in a 4 bend bay in a house in Hampstead NW3. The drop of the curtains is 285 cm….HUGE !!! EN, HA, N10, N11, N12, N13, N14, N15, N16, N17, N18, N19, N2, N20, N21, N22, N1, N3, N4, N5, N6, N7, N8, N9, NW1, NW10, NW11, NW2, NW3, NW4, NW5, NW6, NW7, NW8, NW9, SW1, SW10, SW3, SW5, SW6, SW7, UB, W10, W11, W12, W13, W2, W3, W4, W5, W6, W7, W8, W9, WD. Contact us for more details if needed. We operate within the NW region of the M25, mainly in North London, with customers in West and South West London and the Home Counties. Serving North London and surrounding areas with top quality, hand finished, made to measure curtains, blinds and soft furnishings.